Where has the time gone! ………. the last time I looked in it was October 10th….. There has been quite a lot going on and I thought I would bring my wee blog into touch with those who still follow me.. Some good news first, My daughter returned home after spending several months working in Majorca for my sister, lovely having her back home for a while.. although she does intend to return back to the Balearic Isles next year. We had a bit of a rat problem in November, as many of you know I have a couple of rescue bunnies and they are kept secure in their cages within a secure run… or so I thought! That was until rats decided to dig their way into the run!… so we had to relocate the bunnies into the greenhouse for the winter, it has a concrete base and also rat proof. I called in the pest control people who took care of the rodent invasion… chunky and I found a dead one on the lawn one morning and I didnt realise just how big rats were! excluding the tail it must have been about 7-8 inches long!… so the garden is now rat free thankfully! Because I keep chickens the pest control people reckon they were attracting the rats to the garden, so I made the decision to rehome my 2 chickens 😦 I was so sad to see them go, but they did go to a lovely new home in the middle of nowhere to a lovely young chap. About 3 weeks after they had gone I received an email from him to say that wee Brenda my Partridge Pekin had sadly died, along with 3 of his own birds, a branch had falled off a tree in the severe gales that we had in December and fallen on the birds who were eating from a feeder… poor wee Bren.. I howled for most of the night.. I loved that wee bird! More sad news on the pet front.. Tweed, our little rescue netherland dwarf rabbit passed away … I had noticed a while back that she was getting arthritic in her back legs and losing condition.. she was a wee old lady and I think I mentioned in my last post that I didnt think she would see the winter through and my gut feelings were right!… She is now burried in the garden in a lovely wee spot under an ornamental potted tree and when I stand at the kitchen window I look out over where she is… bless her crabby wee heart, although she was a grumpy wee bunny who would growl and attack you when visited every day, we loved her to bits. This entry was tagged Chickens, December Gales, December Update, Rabbits, Rats, Springer Spaniel. Bookmark the permalink. It’s nice to hear your news and I’m glad that you have a warm spaniel to cuddle. That’s the best cure for sadness I know. 🙂 Wishing you a merry Christmas. 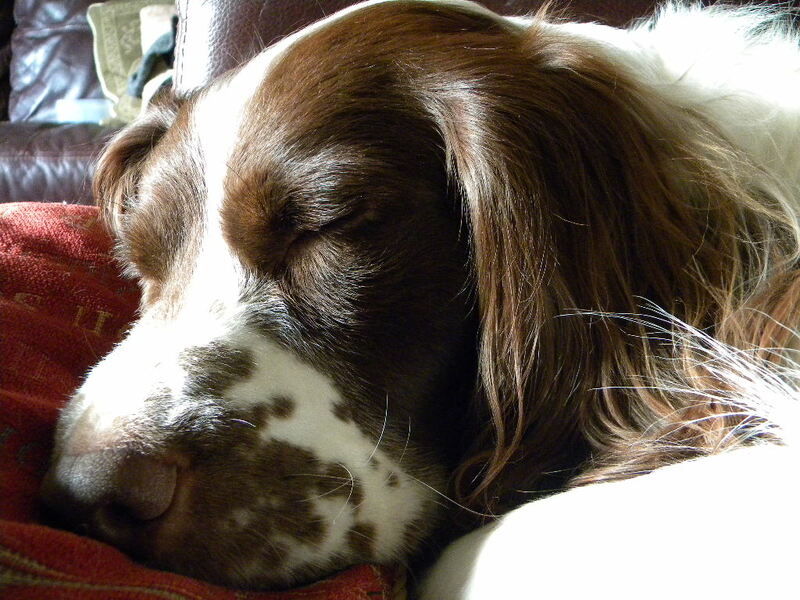 Springers are indeed great and most often constant companions…Smiley is gorgeous! My guy’s name is Parker and he has his own blogspot if you care to check him out. He does have allergies to all kinds of dog food and I’m trying to whip up dishes that make him feel good and keep him healthy. Thank you for sharing Smiley with us. Happy New Year from a Springer lover in Los Angeles. Hi honey, how are you, just found your blog again. Nice to see Chunky too. If you ever fancy another bunny I always have lots of New Zealand whites (babies) and would give you one with pleasure, just ask. Not sure if this is any use, but when female bunnies get grumpy like that it’s usually hormones because they want to be mated……serious pmt, lol. The cure is to get them spayed if you don’t want to breed from them.